honors from Renmin University of China with her Bachelors degree in 2008.
where she studied with Dana Mazurkovich. As the winner of Brumby Concerto Competition, Dr. Shao has performed at concerts in both the US and China. In 2007, she was chosen to represent Renmin University of China to perform a series of concerts at the University of Oklahoma in Norman, Oklahoma. Aspen Music Festival, where she studied with Naoko Tanaka. 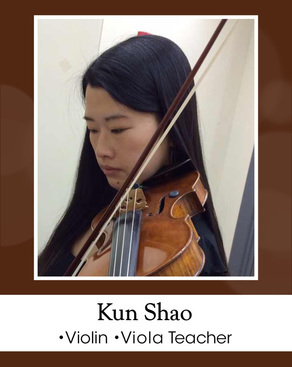 As an orchestra violist, Dr. Shao has worked with many orchestras in China, like the Shenzhen Symphony Orchestra, China National Opera House Symphony Orchestra and so forth. Dr. Shao also performs with many orchestras in New England area, including te Parkway Concert Orchestra in Norwood as concertmaster, New Hampshire Symphony Orchestra, Atlantic Symphony Orchestra, and Indian Hill Orchestra as sectional violinist. Dr. Shao enjoys teaching in her spare time. She has taught in Massachusetts, including the Note-Worthy Experiences studio in Sudbury and the Chung Wah Academy in Boston. She also coached chamber music at Boston University for non-major students. She teaches lessons in English and Chinese. 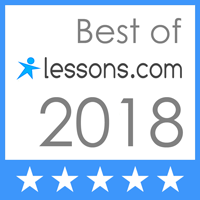 She has been teaching since 2008 and has been with Note-worthy Experiences since September 2016. When Dr. Shao is not playing her violin, she enjoys cooking various foods from all over the world. Now she is living in Medford, Massachusetts with her beloved husband Alexandre Huon and son Lewis Huon.